Greenwich Park, Docklands, Tower Bridge, Big Ben, Buckingham Palace – just some of the amazing sights you will see on what, in my marathon experience, is the best marathon in the world, the Virgin London Marathon. This was my first marathon and if it is the same for you, you will not be disappointed. From the very minute you are a confirmed participant the organisation, online information/support, expo and race day is second to none. Looking back my preparation and training had not been too bad but quite amateurish. These were the days when I didn’t even consider carb gels, music or GPS watches. It was innocent and free running. Kit-wise I was just as bad. 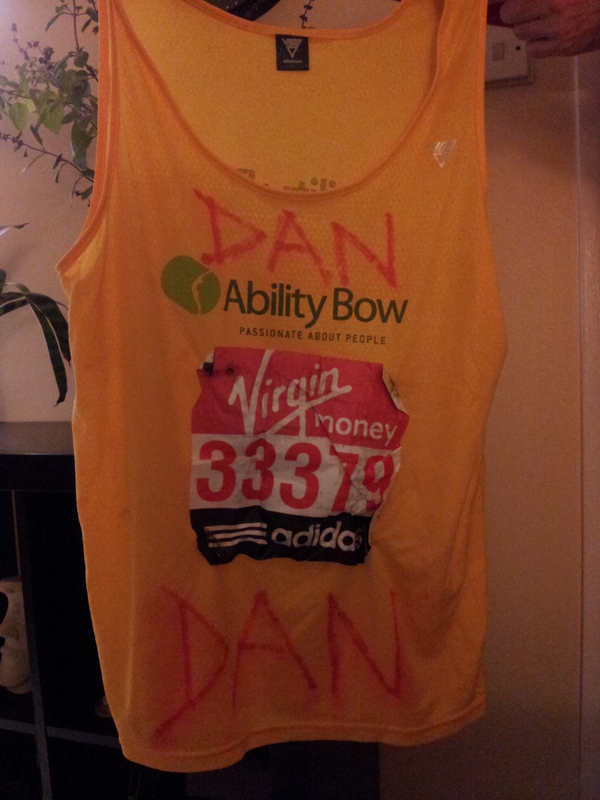 Running for the charity Ability Bow, I had to wear the obligatory vest supplied by them, a yellow singlet. I had never worn a singlet before and on receiving it and trying it on I decided it was too revealing for me so a back up plan was needed. The night before I dug out an old short-sleeved T-shirt and proceeded to cut back the sleeves a bit so I would have some body coverage but with the arms just as free. However my cutting skills went on and on and before I knew it I had frayed sleeves cut to the shoulder, not very professional looking. To go with this developing look, I had decided to wear football socks instead of specialist ones. Full-length black footy socks, and now what seems like several inches thick. What was I thinking? The only quality professional piece of kit was my trainers, Adidas Supernova, purchased wisely at the expo. So there, I was set and as far as I knew suitably ready in the right looking attire to get me through my first ever 26.2. Eek! With three starting points on race day, mine being Greenwich Park, you are immediately looked after by the marshalls and volunteers. Trucks are lined up like in a military parade waiting for your bags to be dropped. Toilets are similarly lined up. Helicopters fly above, a booming MC bellows good luck messages, motivational quotes, jokes, people smile, runners chat all knowing they are on the start line with thousands and thousands of people waiting to cheer once they cross it. I crossed the start line after 12 minutes. The course is generally flat so a good one to nail a PB however there is a small incline or two within the first few miles. Water stations kick in after 5 km and markers are on the km. Among the various sights and ever increasing support from people from all walks of life, Tower Bridge at 21 km mark is an inspiring landmark to cross and will give you motivation to push you on for the next 21 km as you are now on the side of the river which has the finish line. However, with the crossing of the Thames you divert away from the finish line and for a few kilometres you drift back East and into the Docklands area. A feeling of realisation dawns on you that you are still 15-20 km away from the delights of the Mall finish line. Down the Embankment and you will view Big Ben and crowds will be strong however some fellow runners will not be. Mental toughness needs to kick in to see you down the last major stretch before you hit Birdcage Walk. Crowds, marshalls, noise, water stations, and smiling faces become closer, louder and more intense come the arrival at Buckingham Palace and the finish line. Once across the finish line support from the volunteers is instant and with a smile. You are quickly given your well-deserved medal then up onto a mini platform for your chip to be taken. Goodie bag next and then collection of your own bag, with the trucks awaiting, just like at the start line. This whole process is quick and efficient. You’re now done. London Marathon completed. Free travel on the London Underground is still valid making you feel even more proud and special. Strangers smile and say well done. For a time London becomes very friendly. Enjoy, as it’s quite a feeling. It was a great race this year. We are both applying for next year.